Ophelia is fighting wsw wind shear with most of the unsettled weather on the east side of the circulation. 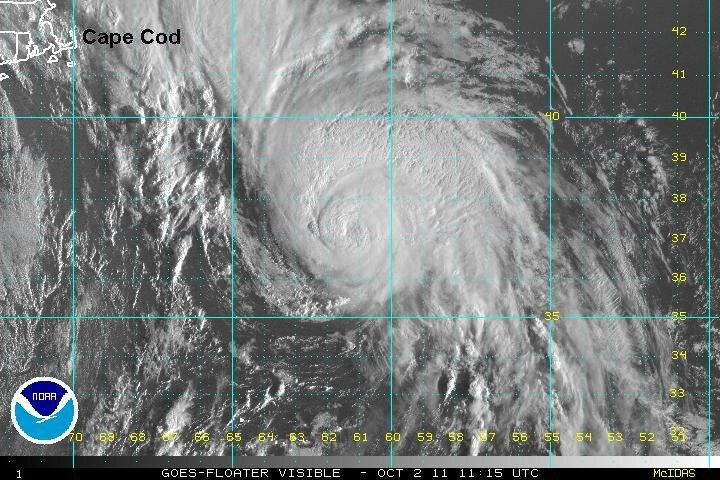 Visible satellite imagery show that Ophelia is moving north and not northwest per the NHC advisory. It is very hard to find a low center and ascertain motion with IR satellite imagery like they had to for their last advisory. Wind shear is predicted to lessen, so Ophelia may have an opportunity to strengthen over the next several days. 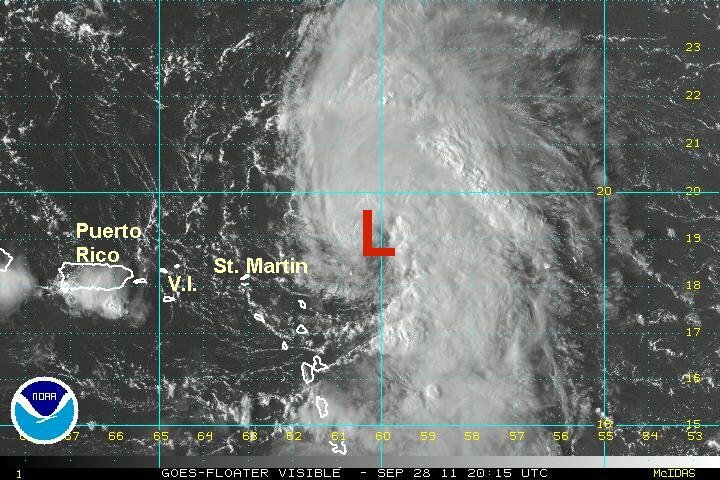 At 7 am edt / ast Ophelia was centered at 18.8 N / 60.0 W or about 215 miles east of the northern Leewards. Top sustained winds estimated at 35 mph (NHC 35 mph). Movement: north 5 mph. Pressure estimated at 1008 mb. 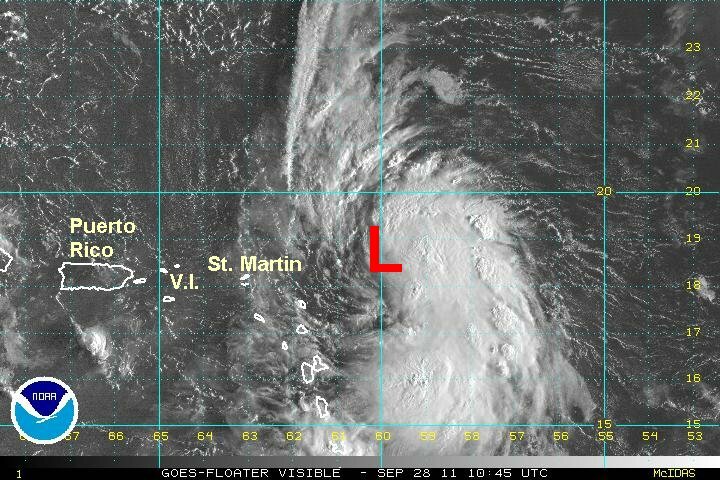 Forecasts take Ophelia north northwest east of the Lesser Antilles. It may be in the vicinity of or east Bermuda by Saturday night. Interests in the Lesser Antilles and Bermuda should follow the progress of Ophelia. Ophelia is starting to gain convection as it pulls away from the Leewards Islands this afternoon. A few showers are affecting the Lesser Antilles and will diminish by tomorrow. At 5 pm edt / ast Ophelia was centered at 19.3 N / 60.6 W or about 180 miles ene of the northern Leewards. Top sustained winds estimated at 45 mph (NHC 50 mph). Movement: nw 7 mph. Pressure estimated at 1001 mb. 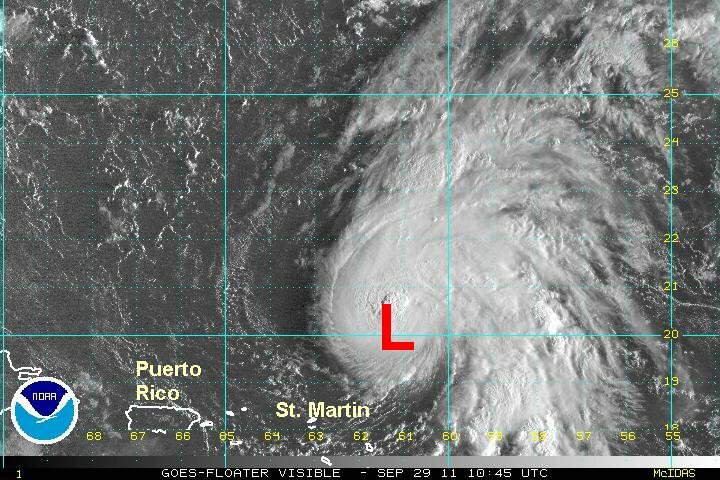 Forecasts take Ophelia north northwest east of Bermuda by Saturday night. It will then accelerate and move nne possibly brushing Newfoundland Sunday night. 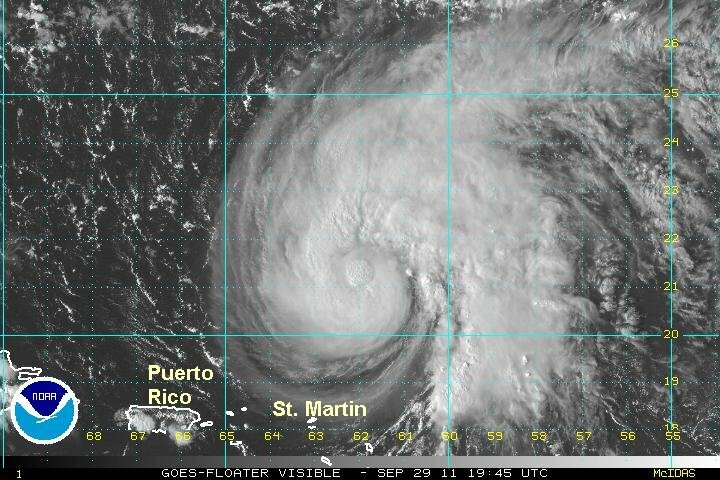 Interests in Bermuda and eastern Canada should follow the progress of Ophelia. The wind shear is decreasing with Ophelia. It is evidenced by the low center moving back under the deep convection. A large mass of thundershowers are now near and north of the center of the low. It is expected that Ophelia will become a hurricane as it begins to accelerate northward. Only a few showers are affecting the Leewards with Ophelia's circulation this morning. At 7 am edt / ast Ophelia was centered at 20.2 N / 61.2 W or about 200 miles ne of the northern Leewards. Top sustained winds estimated at 60 mph (NHC 60 mph). Movement: nnw 7 mph. Pressure estimated at 997 mb. 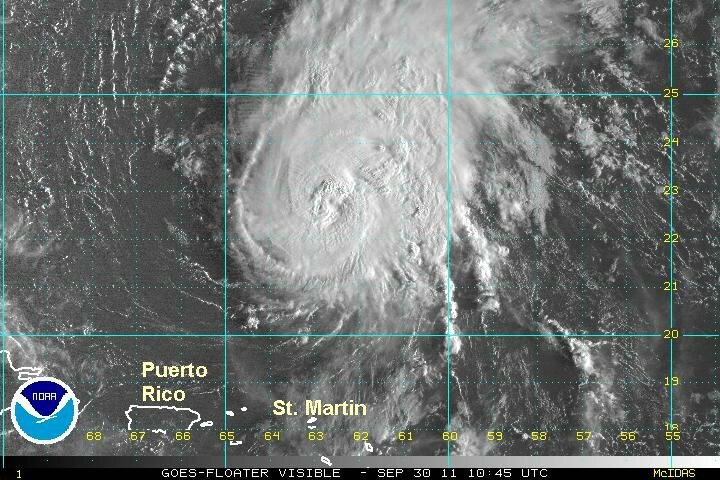 Forecasts take Ophelia north northwest east of Bermuda by about 100-200 miles Saturday. Some effects of rain and wind will probably be seen as Ophelia will likely be a hurricane. It will then accelerate and move ne possibly brushing Newfoundland Sunday night. Ophelia has become a hurricane as upper level outflow and banding has improved. A little tongue of dry air was sucked into the circulation giving the appearance of an eye earlier today. A bona fide eye is now forming but is not visible quite yet. Additional strengthening is likely as Ophelia moves northward and accelerating into the northern north Atlantic. At 5 pm edt / ast Ophelia was centered at 21.4 N / 62.3 W or about 770 se of Bermuda. Top sustained winds estimated at 75 mph (NHC 75 mph). Movement: nnw 9 mph. Pressure estimated at 987 mb. Forecasts take Ophelia north northwest east of Bermuda by about 100-200 miles Saturday. Some effects of rain and wind will probably be seen as Ophelia passes by. It will then accelerate and move ne possibly brushing Newfoundland Sunday night. Ophelia has formed an eye now apparent on the IR satellite imagery. 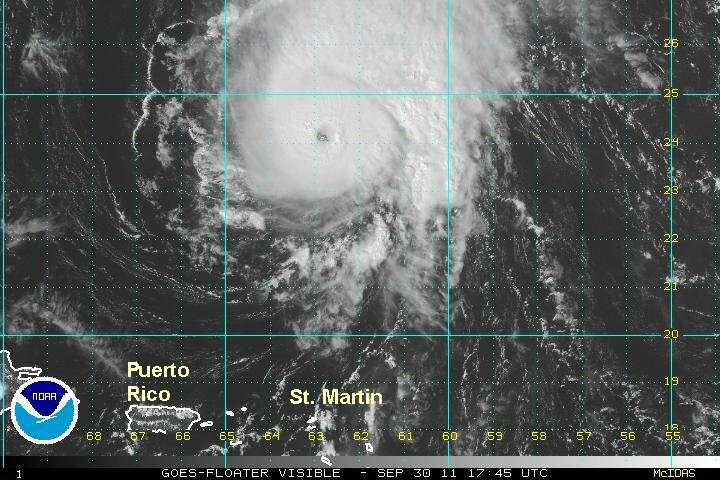 Clouds tops have cooled significantly, but I am estimating wind speed a touch lower than the hurricane center estimate. The effects have pulled away from the Caribbean and will be felt in Bermuda Saturday as Ophelia accelerates north tomorrow. At 7 am edt / ast Ophelia was centered at 22.5 N / 62.6 W or about 685 miles sse of Bermuda. Top sustained winds estimated at 95 mph (NHC 100 mph earlier advisory). Pressure estimated at 973 mb. Ophelia has rapidly deepened today and is a major hurricane. Ophelia may become a cat 4 before shear starts affecting the circulation in about 24-36 hours..
At 4 pm edt / ast Ophelia was centered at 24.7 N / 62.8 W or about 540 miles sse of Bermuda. Top sustained winds estimated at 125 mph (NHC 115 mph earlier advisory). Pressure estimated at 952 mb. Movment north at 12 mph. 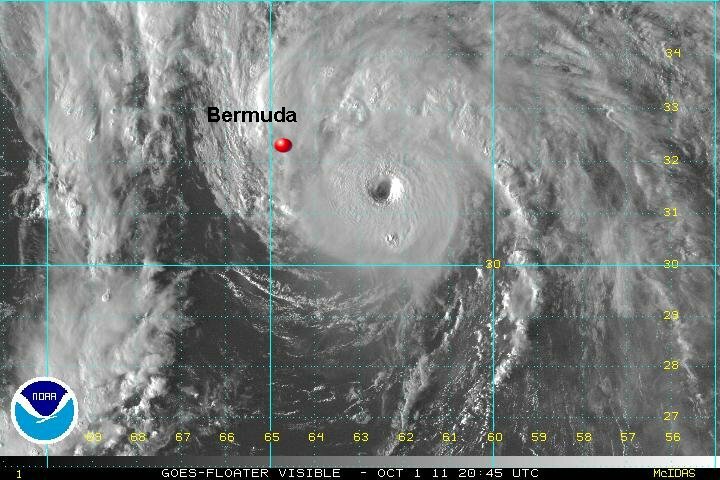 Forecasts take Ophelia north east of Bermuda by about 100-150 miles Saturday. Some effects of rain and tropical storm force winds will probably be seen as Ophelia passes by. It will then accelerate and move ne possibly brushing Newfoundland Sunday night. Ophelia maxed out last night at 140 mph. The eye wall intensified last night just east of Bermuda. Bermuda dodged a bad situation as the hurricane passed 140 miles to the east. Winds gusted to just under tropical storm strength and a few rain bands were seen. This morning Ophelia is accelerating northeast and is turning from eastern Canada. It will quickly lose strength as it moves over colder water today and become extratropical over the next 24 hours. 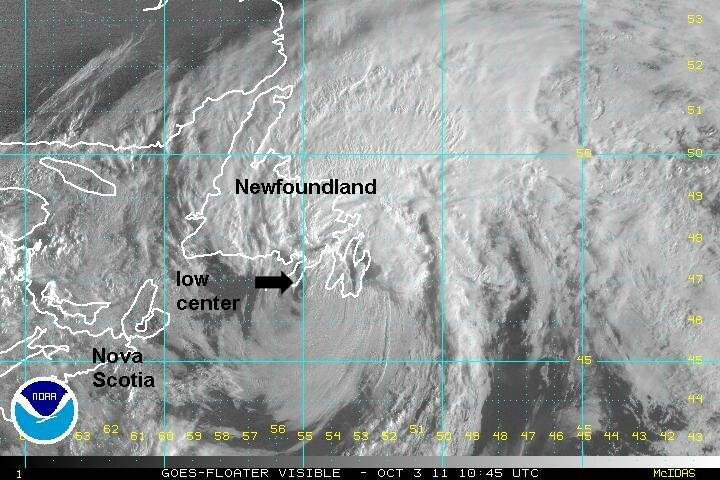 At 8 am edt / ast Ophelia was centered at 37.5 N / 61.2 W or about 760 sw of Cape Race, Newfoundland. Top sustained winds estimated at 125 mph (NHC 125 mph earlier advisory). Pressure estimated at 948 mb. Movment nne at 30 mph. Forecasts take Ophelia nne today and ne by tonight. It will move just south of Cape Race, NF tonight as it becomes extra tropical. Interests in Newfoundland, Canada should follow the progress of Ophelia. Ophelia continues over cooler water today. It is steadily losing strength and is becoming extratropical. 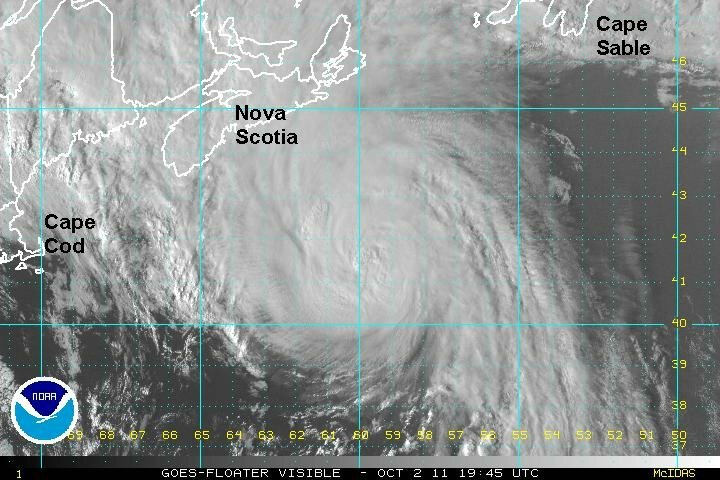 At 5 pm edt / ast Ophelia was centered at 41.6 N / 59.9 W or about 485 sw of Cape Race, Newfoundland. Top sustained winds estimated at 95 mph (NHC 100 mph earlier advisory). Pressure estimated at 964 mb. Movment nne at 33 mph. Forecasts take Ophelia northeast near Cape Sable, Newfoundland tomorrow morning as it becomes extratropical. Ophelia has made landfall on the southeastern end of Newfoundland as it is losing tropical characteristics. NHC made their strength estimate based on a satellite reading. Recent observations from Newfoundland show very little winds. In fact I believe that my 50 mph winds may be too strong! At 7 am edt / ast Ophelia was centered near 46.9 N / 55.0 W or over the Avalon Peninsula of Newfoundland. Top sustained winds estimated at 50 mph (NHC 70 mph earlier advisory). Pressure estimated at 964 mb. Movment ne at 43 mph. Forecasts take Ophelia across the north Atlantic as a non-tropical system. This will be the last update on Ophelia.